Endless Wartime is a strange book. It exists in the murky subspace between the primary Marvel continuity, and the cinematic universe – despite being ‘officially’ a part of the former – and as such, needs to be viewed from two different perspectives. Existing fans of Marvel comics may find the overdone exposition and apparent regression of the characters grating, and out of place, while people entering the format for the first time may find that it’s a great way to ease in to the 616 versions of the characters they know from on screen. As a whole, Endless Wartime is a good looking book, with a solid plot, and some great dialogue. The art is reasonably pleasing, if a little inconsistent, and Ellis’ political and social commentary throughout never feels forced or like it’s being shoved down your throat. So it’s good then, right? Ehhh… not so much. My conflicted feelings about this title most likely stem from my dislike of the increasingly blurry lines between universes, so I’m going to set that aside for a moment, and look at it from two viewpoints. First, from that of an existing fan of Marvel comics, and secondly, from someone who is coming to dip their toes in the graphic form of these characters for the first time. From the perspective of a long time fan, this book is almost illogical in places. 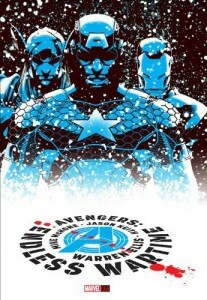 Unless I had known this book is intended to fit into the mainstream continuity, I could easily have assumed it was intended to exist in its own universe – a mash up of 616 and the MCU – or possibly a way to introduce other characters (ie Wolverine), into the MCU in a way that isn’t impinged by film rights. 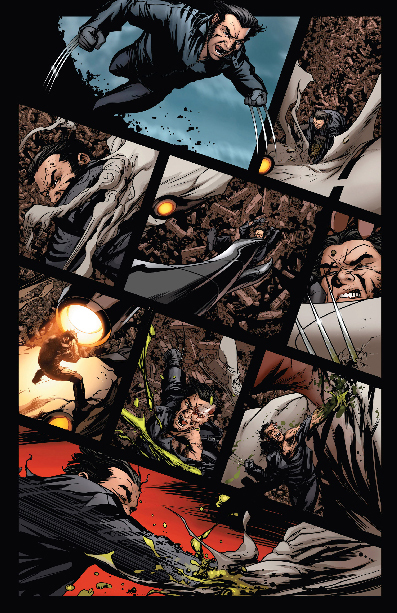 While it shows the characters in their current 616 incarnations and costumes, their interaction does little to demonstrate a long standing association and camaraderie. Now, obviously these characters haven’t always played for the same side, but in Endless Wartime they genuinely seem to dislike each other, which is pretty contradictory to what we’re reading at the moment in Marvel NOW! Add to that the pages and pages of Steve suffering from man out of time-itis, and Carol checking in about her genetic make-up, and it feels almost like we’ve slipped back into the seventies for a hundred or so pages. Clint though, well. Considering his current disaster of a life, I guess waking up in a dumpster is about par for the course. Apart from the introduction of the threat in the first few pages, the front third of the book almost deals exclusively with Steve, and his struggle to integrate into the modern world. What? Not only is this awful characterisation, it pretty much flies in the face of decades of character development. More than ten years of Marvel time in the future, and he still hasn’t figured out how to use a coffee machine? Most of my thoughts boiled down to oh god why no stop this is just nope argh for the first twenty or so pages. There are some absolutely brilliant lines, but they’re overshadowed by Ellis’ struggle to introduce the characters to new readers without it feeling like ten pages of clunky exposition. Lines like Clint, we both know I couldn’t possibly be your mother. You certainly never acted like I was, and …yes, I am a genetically stable fusion of human pilot and an alien soldier race from the Large Magellanic Cloud, are so bad, I almost shut the book and tossed it under my bed, to lie in wait for rediscovery next time I vacuum under there (hint: that will be in about two years). What about the rest of it? It’s an okay story. The violence was certainly toned down to appeal to a younger audience, but there are some great action scenes, and towards the end I felt that the Avengers were starting to feel like a team again, even if Steve was still blatantly mischaracterised, and it felt like it ended with a whimper rather than the bang I was hoping for. Mike McCone’s art is very good in places, but flat and not particularly dynamic in others. The action scenes are well put together, but some of the more dialogue heavy pages feel rushed and inconsistent. I kind of wish they had chosen to take a risk with the art in this book, rather than going with someone who has a pretty unremarkable (but still skilled) style. Taking a look from a person picking up a Marvel book for the first time though, things are a little different. While I think the exposition at the start is still overdone, it’s certainly something that’s needed to introduce Carol and Logan (although I’m sure most fans of the MCU have also seen the X-Men films). Tony’s very similar to his MCU counterpart here which, considering Robert Downey Jr’s success in the role, is probably a smart move. Clint’s pretty much a blank slate from an MCU fan’s perspective, seeing as he was possessed by Loki for much of The Avengers, so they’ve gone for full on ‘hot mess wisecracker with a death wish’, which will only endear him even more to an already rabid fanbase. Sadly, he’s also bullied an awful lot during this book, which won’t go down well with anyone with a conscience. Thor is Thor, and I quite enjoyed how Ellis presented Bruce. The women are great, with both Carol and Natasha being featured throughout the book. They both have some great lines, and hold their own with the guys, although like everyone else, they are needlessly mean from time to time. They’re drawn respectfully, rather than ridiculously (apart from a couple of borderline panels), and Natasha always has her (MCU inspired) suit zipped up, which is a pleasant suprise. They’re also however, overshadowed by the men. Half way through Endless Wartime, even the least observant reader will recognise Steve and Thor being heavily featured, a clear ploy at generating interest in Thor: The Dark World, and Captain America: The Winter Soldier. Nice try, guys, but it’s a fail on the female representation front, sorry. I get why you did it, but that doesn’t mean I have to like your reasons. So really, what I guess I’m saying is that the characterisation is a problem no matter what perspective you take. If you know the history of the characters, then much of the interaction feels forced and uncomfortable. If you don’t, then even the characters who have been written reasonably well, feel like overused tropes that only has one setting – snark. Most new readers will probably find the plot interesting and intriguing, and be pleasantly surprised by the political commentary throughout. Ellis’ story is completely bizarre, but strangely believable as usual, but it’s still missing a real hook that would make someone want to pick up one of Marvel’s monthly titles. Despite it’s weirdness, the core concept seems unremarkable. My apathy for the plot itself is demonstrated by my inability to really say all that much about it. Endless Wartime isn’t a bad book. It’s really good in places, actually. It looks beautiful in hardback, and has some really great design elements outside of the main story pages themselves, and I’m glad I waited to review it once my physical copy arrived, rather than based on its digital version. It’s often funny and clever, and has some excellent action scenes. It just suffers from the desire to appeal to an audience that is perhaps a little more savvy than the creative team is giving them credit for. What Marvel is trying to do here is smart – release self contained stories, that don’t require the reader to know everyone’s back story or history to be able to make sense of the book. I’m really pleased that they are aiming to encourage new readers, but I’m just not sure they’re going the right way about it.